Editor's note: Rainer Weiss, Barry C. Barish and Kip S. Thorne won the 2017 Nobel Prize in physics. They are three members of the LIGO-Virgo detector collaboration that discovered gravitational waves. The story below details the exciting discovery, which was announced in 2016, and AU's role in the collaboration and gravitational-wave research. The gravitational waves were detected on September 14, 2015 at 5:51 a.m. Eastern Daylight Time (9:51 UTC) by both of the twin Laser Interferometer Gravitational-wave Observatory (LIGO) detectors, located in Livingston, Louisiana, and Hanford, Washington, USA. The LIGO Observatories are funded by the National Science Foundation (NSF), and were conceived, built, and are operated by Caltech and MIT. The discovery, accepted for publication in the journal Physical Review Letters, was made by the LIGO Scientific Collaboration (which includes the GEO600 Collaboration and the Australian Consortium for Interferometric Gravitational Astronomy) and the Virgo Collaboration using data from the two LIGO detectors. American University is a member of the LIGO Scientific Collaboration. AU currently is the sole university in Washington, D.C. to participate in LIGO and is led by Gregory Harry, assistant professor of physics. "The detection of gravitational waves marks the beginning of a new way of observing the universe," said Harry, one of the authors of the detection paper published in Physical Review Letters. "Now that physicists have evidence that LIGO detectors can detect gravitational waves, it is exciting to think about how much we will likely learn about the nature of gravity." 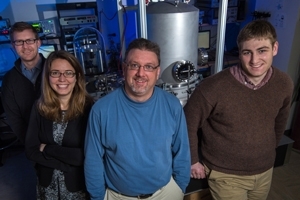 At AU, researchers work to fine-tune the optical materials used in the LIGO detectors. Mirrors used in the detectors have reflective coatings. Over time, researchers realized the coatings limited the detectors' sensitivity because of thermal vibrations. Harry's team helped to develop improved coatings that allowed for greater sensitivity. Experimental research by Harry's team will continue to focus on new and improved ways to further reduce noise. Since 2011, more than 10 AU undergraduate students have participated in LIGO research at AU, including two who contributed research to the gravitational waves discovery and are now physics Ph.D. candidates working on LIGO at universities in Scotland and New York. The AU LIGO group is also involved in public outreach and is developing an "Optics Olympiad," which will bring D.C. public schools students to campus to share in the excitement of LIGO research. American University is proud to have worked with many outstanding scientists at other universities to have brought LIGO to the sensitivity to make this detection. The list includes Georgia Tech, California State University-Fullerton, Columbia University, Stanford University, University of Oregon, University of Maryland, University of Michigan, Carleton College, University of Texas Rio Grande Valley, Penn State University, Hobart & William Smith Colleges, Embry-Riddle Aeronautical University, Trinity University, and Whitman College. The discovery of gravitational waves was made possible by the enhanced capabilities of Advanced LIGO, a major upgrade that increases the sensitivity of the instruments compared to the first-generation LIGO detectors, enabling a large increase in the volume of the universe probed-and the discovery of gravitational waves during its first observation run. The U.S. National Science Foundation leads in financial support for Advanced LIGO. Funding organizations in Germany (Max Planck Society), the U.K. (Science and Technology Facilities Council, STFC) and Australia (Australian Research Council) also have made significant commitments to the project. Several of the key technologies that made Advanced LIGO so much more sensitive have been developed and tested by the German UK GEO collaboration. Several universities designed, built, and tested key components for Advanced LIGO: The Australian National University, the University of Florida, Stanford University, Columbia University of New York, and Louisiana State University. LIGO research is carried out by the LIGO Scientific Collaboration (LSC), a group of more than 1,000 scientists from universities around the United States and in 14 other countries. More than 90 universities and research institutes in the LSC develop detector technology and analyze data; approximately 250 students are strong contributing members of the collaboration. The LSC detector network includes the LIGO interferometers and the GEO600 detector. The GEO team includes scientists at the Max Planck Institute for Gravitational Physics (Albert Einstein Institute, AEI), Leibniz Universität Hannover, along with partners at the University of Glasgow, Cardiff University, the University of Birmingham, other universities in the United Kingdom, and the University of the Balearic Islands in Spain. Significant computer resources have been contributed by the AEI Atlas cluster, the LIGO Laboratory, Syracuse University, and the University of Wisconsin Milwaukee. LIGO was originally proposed as a means of detecting these gravitational waves in the 1980s by Rainer Weiss, professor of physics, emeritus, from MIT; Kip Thorne, Caltech's Richard P. Feynman Professor of Theoretical Physics, emeritus; and Ronald Drever, professor of physics, emeritus, also from Caltech. Virgo research is carried out by the Virgo Collaboration, consisting of more than 250 physicists and engineers belonging to 19 different European research groups: 6 from Centre National de la Recherche Scientifique (CNRS) in France; 8 from the Istituto Nazionale di Fisica Nucleare (INFN) in Italy; 2 in the Netherlands with Nikhef; the Wigner RCP in Hungary; the POLGRAW group in Poland and the European Gravitational Observatory (EGO), the laboratory hosting the Virgo detector near Pisa in Italy.